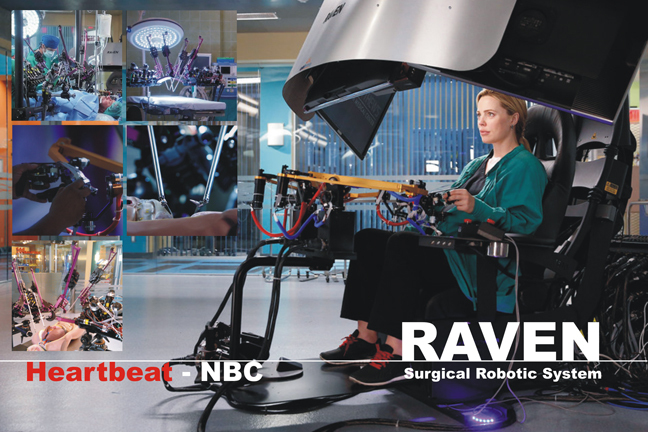 UCLA MAE Professor Jacob Rosen’s RAVEN surgical robotic system was featured on the NBC medical drama “Heartbeat” during the episode “The Land of Normal” which aired April 20, 2016. Prof. Rosen was contacted by researchers from NBC. Commercially available robotic system which are heavily regulated by the FDA are prevented from featuring new and futuristic approach to surgical robotics. However it is the core and true nature of research platforms to explore the boundaries of the impossible. As such Raven was selected to be featured on NBC Heartbeat. Rosen’s post-doc Ji Ma was able to take the entire system locally to NBC studios. Ma was on-site to instruct the cast and crew how to use the system. “RAVEN is an intuitive system, you don’t need to be a surgeon to manipulate it,” said Rosen. RAVEN is a surgical robotic system designed for minimal invasive surgery. The system was developed and studied in the past 15 years and followed Rosen’s academic career at the University of Washington, UCSC , and currently at UCLA. The project was originally funded by the US military and later on by the NSF based on a need for a deployable and portable surgical robotic system in the field during US Desert Storm operation. RAVEN got its name from the influence of the Native Americans in Washington State, as the system is colored black, resembles a bird, and has positive uses. “The Indians in Washington State viewed ravens as a positive sign,” said Rosen. RAVEN is an open source (hardware & software) platform for research in surgical robotics. This contradicts the close source nature of all the commercially available surgical robotic systems that are not “open” for academic research. “The system is currently installed in 20 research labs worldwide creating a community of collaborative researchers and enables to explore new frontiers in the field”, said Rosen. Images are from Prof. Rosen’s lab, and NBC.